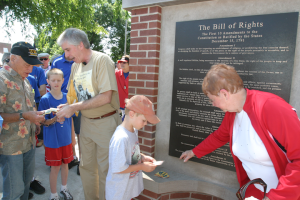 America’s first Bill of Rights display was dedicated on July 5, 2008, at the Poweshiek County Courthouse in Montezuma, Iowa. The scene was straight out of a Frank Capra movie. While the crowd sang the national anthem, the morning’s first breath of wind snapped the flag out smartly just as the it reached the top of the flagpole – as if in response to the color guard’s salute. Then, at the precise moment of the unveiling, the courthouse clock tower bells rang out; not as a part of any grand plan, but because it happened to be exactly 11 AM! 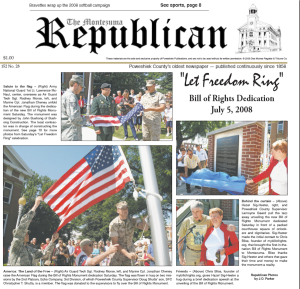 The largest crowd in memory for the annual Independence Day celebration burst into applause, and the celebration began. It was a fitting ending for our first Town Square project, which was truly a community effort. 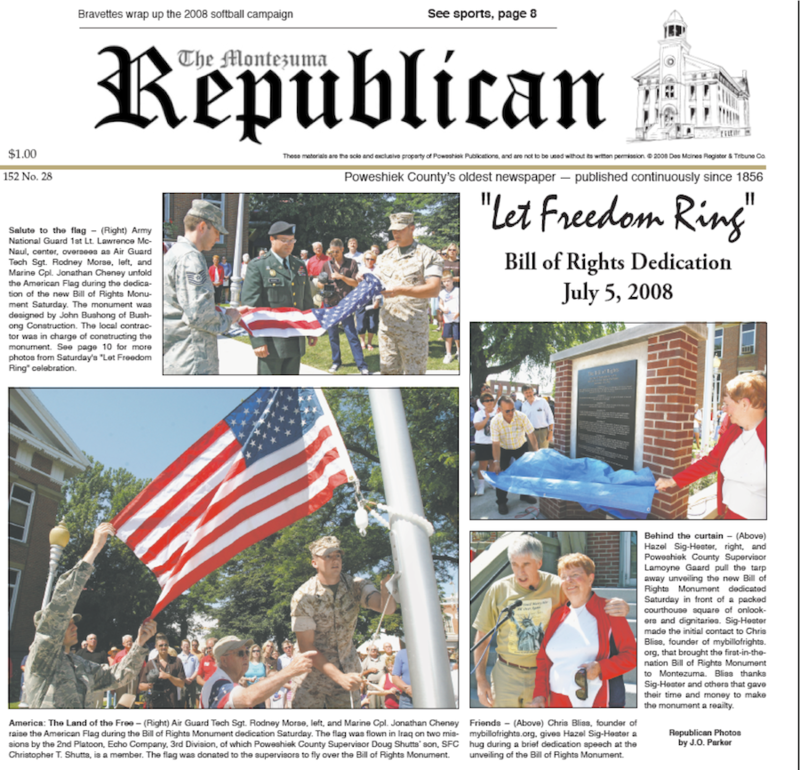 Hundreds of citizens from across the county contributed, led by longtime resident Hazel Sig-Hester and the Poweshiek County Board of Supervisors, and with key support from local business leaders Frank Brownell and Bill and John Bushong. They were joined by small contributors from every region of the country who responded to our special appeal. On behalf of MyBillofRights.org, congratulations and thanks to everyone involved with helping us complete the first of what we hope will be many more such displays throughout America.